Here you can explore a selection of member schools and a showcase of the wonderful diversity of capstone programs. At Bosque School in Albuquerque, New Mexico every senior completes a year-long independent research project and delivers his or her findings in a twenty-page research essay as well as in a twenty-minute public presentation. These capstone projects may involve interpretation of new primary source material, or reading sources in the original Spanish or Latin, or ethnographic fieldwork, or scientific demonstrations or experiments, to name a few of the options. Over the course of the year, students will submit a formal prospectus, conduct text-based research and fieldwork, and test their arguments at a formal viva or defense. Though the project is supported with a skills curriculum, students exercise considerable independence in planning and conducting their own work. Each student is advised by a committee of faculty members who also read the student's final Senior Thesis. Presentations of findings take place at Colloquium, a celebratory two-night event held each year during the week before graduation. Signature is Emma Willard School’s capstone program for juniors and seniors that allows them to deeply explore a personal passion. Signature students work on a project for two semesters with an on-campus mentor and/or an expert off-campus, and share the summation of their work in a presentation to the entire school community. This opportunity is for students who have a demonstrated passion for a topic, have identified adults to work with, and have dedicated a sufficient amount of time to complete a project. Capstones at The Hillbrook School are a culminating opportunity for 8th grade students to drive their own learning on a project that applies curiosities and skills they have learned so far to a larger purpose, product, or mission. Capstone students explore a real-world topic or passion of their choice and are encouraged to pursue a project that inspires them to reach beyond themselves and make a difference in the world. They do so by pursuing a relevant question or claim that makes an impact beyond their own peer group. This project fosters self-discovery and the building of identity that can carry into high school and beyond. Hillbrook Capstone is a community celebration of learning that features each student and showcases their individual passions, strengths and process. 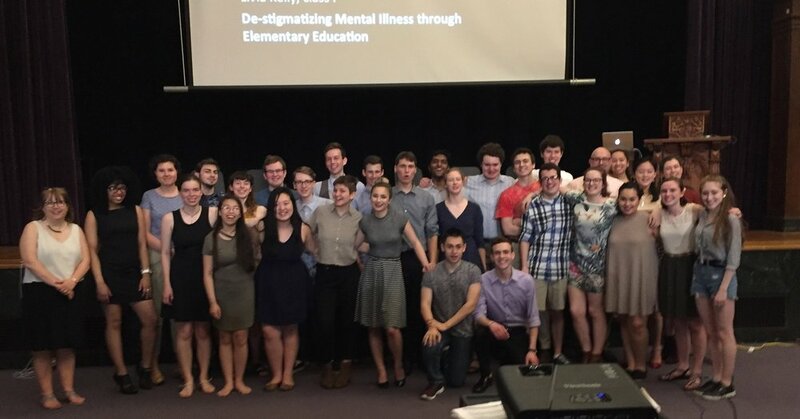 Senior Capstone at Boston Latin School enables students to develop advanced research, writing, and presentation skills, while grappling with essential questions that span disciplines. It pulls together and further refines the skills students have developed and advanced in all courses during their Boston Latin School education. It culminates in the creation of a truly Interdisciplinary Capstone project that students conceive and execute with the support of faculty mentors. An integral part of the Thacher academic experience since 1992, the Senior Exhibition program is a year-long independent project exploring a topic of the student’s choice. The program is divided into three phases: topic selection in the fall, research in the winter, and presentation in the spring. Students produce a variety of deliverable materials, and the project culminates in a 30 minute presentation in April. The program rests on the belief that the senior year is an ideal time for students to explore individual passions, to work closely with faculty members outside of the classroom setting, and to enrich the school community by crafting engaging and enlightening presentations. NNHS’s Capstone project provides second-semester Seniors with a critical learning experience and an opportunity for intellectual problem solving, social change, and community service. The focus of CAPS is to put students in the position of the “expert” in an area of study or in a career setting of their choosing. CAPS projects require students to develop competency in gathering, analyzing, and reporting on data. We encourage all 1st term seniors with a passion for experience-based learning to consider signing up for CAPS. Authentic and personalized Capstone programs have been a part of the Newton North experience since 1976.